Do you need a juice break? Find out the top reasons why you just might. We are bombarded everyday by harmful substances such as bacteria, pesticides, food additives, and environmental pollutants. These toxins, as well as drugs and chemicals, are filtered out by an internal detoxification process and eliminated through our intestines. The problem is, the human body can only take so much and our environment is getting worse. In this video, we share the top 3 reasons you need a juice break and what you can expect following an effective juice break program. 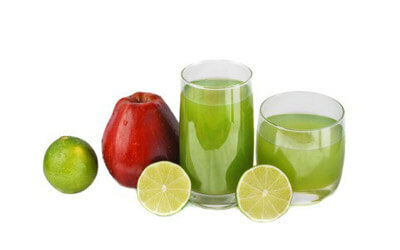 Soothing and refreshing, this juice tastes like a mild, refreshing lemonade. In a low-rpm juicer, alternate pressing Fuji apple slices with lemon sections.